In the mountains, it’s hard to find anything vaguely resembling a beach. Most river and lake banks are simply too steep and too rocky. 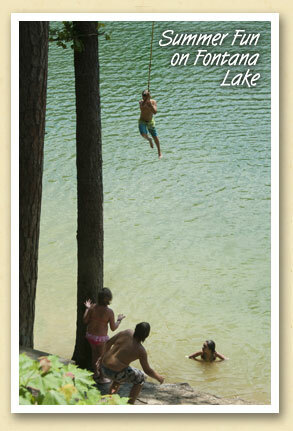 One exception is the so-called ‘finger lakes’ area of Fontana Lake where you’ll find a small park with picnic tables, public restrooms and a swimming area with rope swing. Since there are no life guards, you naturally swim at your own risk. The park is on the south side of Highway 28 near Almond Boat Park. Nowhere else in the Smokies will you find as many different ways to enjoy water as the Bryson City area offers. To learn everything you can do in ‘Mother Nature’s Water Park’ go here.